SEAMLESS LIGHT IMPACT SPORTS BRA. Seamless design feels smooth against your skin. BLACK & WHITE. Size = SMALL. Removable pads provide enhanced coverage, wire free. V-back strap design with a horizontal connecting strap lets you move freely. The Nike Pro Sparkle Training Tights hug your legs to help keep you dry, comfortable and moving freely during your workout. A snug elastic waistband holds the tights in place while four-way stretch fabric and flat seams allow you to move freely in any direction. Size - XXL. I will be happy to work things out. Color - Black. Medium Nike Women’s Sportswear Metallic AOP Long Sleeve Crop Top AV4986-010. Condition is New with tags. Shipped with USPS First Class Package. Elastic waistband with interior drawcord to personalize fit. Color: Black / White. Modified racerback permits a smooth, full range of motion. It is raised in the back for added coverage as you bend and stretch. Dri-FIT Technology wicks sweat away from your skin to help keep you dry and comfortable. Machine wash. Fabric: Body/waist lining: 80% nylon/20% spandex. Elastic waistband. Machine wash. Fabric: 88 % polyester, 12% spandex. This item is a sample issued by Nike. IT IS GENUINE NIKE! Trending at $32.27eBay determines this price through a machine learned model of the product's sale prices within the last 90 days. Wider Nike Pro waistband improves the fit, keeping your shorts in place while you're in motion. One of the most versatile training shorts just got a better fit and better fabric. Here are you new go-to shorts. DRI-FIT COMFORT. FREEDOM TO MOVE. Flat seams move smoothly against your skin. Machine wash. Inseam gusset enhances range of motion. · We DO NOT hold any of our products under any circumstances. 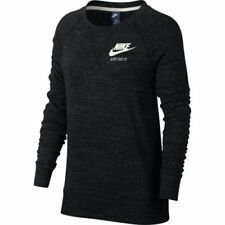 Nike Women’s Cotton Gym Training Tight Logo Black AH1034 Size Medium. Condition is New with tags. Shipped with USPS First Class Package. Color is black with a white edging. White Nike embroidered logo on lower left. Internal attached liner. Waistband tie is missing. NIKE Sportswear MODERN Short Sleeve DRESS Style/Color - 938084 010 Black Size: Women's Small 100% Authentic Nike New With Tag With the dress laying flat, it measures: Length: 35.5 inches Chest: 20 inches ---Rib crewneck short sleeve dress ---Vented tennis tail hem for more coverage ---French terry interior for warmth and comfort ---Length of dress goes right above knee ---Fabric: 52% Cotton, 29% Polyester, 9% Rayon International Buyers – Please Note: · Import duties, taxes and charges are not included in the item price or shipping charges. These charges are the buyer's responsibility. · Please check with your country's customs office to determine what these additional costs will be prior to bidding/buying. Pleated skirt allows you to move with ease. We’ll get back to you as soon as we can! Made with lightweight stretch woven fabric with Dri-FIT technology to wick sweat away, keeping you cool and comfortable. Trending at $23.26eBay determines this price through a machine learned model of the product's sale prices within the last 90 days. 57% cotton 32% polyester 11 % Spandex. knit construction. Nike DRI-FIT. Nike 845786-010. Black and Red. 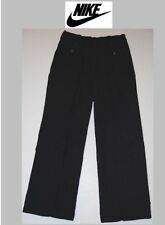 Inseam length: 4.5". You may also be interested in. Nike Just Do It Black Athletic Compression Pants/ Leggings. Fabric: Organically Grown Cotton 57%, Spandex 11%, Polyester 32%. Total Length~33". Waist~14". Inseam~26.5". Nike Power fabric provides stretch and support. Fabric: Body: 74% polyester/26% spandex. Sleeves/panel: 83% polyester/17% spandex. Machine wash. Tight fit gives a supportive, held-in feel. Cutout at the back enhances ventilation. Size Large, black with gold logo, cotton/poly/spandex. If a best by or expiration date is on the item, we will notate that. White Nike embroidered logo on lower left. Internal attached liner. Waistband tie is missing. Nike Dri-Fit "Ten Less Plastic Bottles - One Legend" Recycled Yoga Pants. 29" inseam, waist is 14" across (laying flat, unstretched). These are pre-owned and in MINT condition with no holes, snags, stains or signs of wear! Authentic Nike Air Jacket. I will provide a prompt and courteous reply. Color & Lighting . 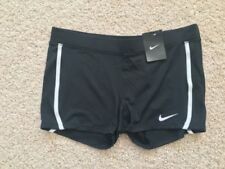 Nike Dri Fit Black Pleated Athletic Golf Tennis Skirt Skorts. Size: Small 4-6. Length (front) - 13". - LOOK AT PHOTOS FOR ACTUAL CONDITION.